Custom-matched aggregates, matrix and mix design provide matching replacement concrete mixes for large-scale repairs/replacement. Ice -9 (RL-9) is an additive for mortars, stuccos and concrete that improves freeze-thaw resistance even in the presence of ponded deicing salts. It also improves bond strength and reduces shrinkage. Edison Coatings, Inc. and BioLime, Inc. have entered into an agreement to distribute NHL 3.5 Natural Hydraulic Lime and NHL 3.5 based mortars and stuccos. Edison will stock NHL 3.5 and produce NHL 3.5-based mixes in its Plainville, CT facility. Additional inventory will be situated in the Ottawa, Ontario area by Edison's distributor, MGC Heritage Masonry. AQRYL-X 200 is a high performance, very-low VOC coating designed to provide exceptional water-resistance, vapor permeability and maximum durability. AQRYL-X 200 develops high bond strength to a wide variety of substrates under dry and damp conditions, and retains high performance even after extended moisture exposures. The 17 g/l interior/exterior coating is UV-stable, low in odor and maintains bond to difficult substrates like glazed masonry and glass, even after weeks of water immersion. It is available in an unlimited range of custom colors, in Clear Base and in White Tint Base for field-tinting. Adhesion to slick existing glazes is one of the great challenges in the restoration of architectural terra cotta. Products like Edison Coatings Elastowall 351 and Aquathane UA210 have long proven capable of developing bond strengths up to 500 psi or more, but when substrates are subject to periods of prolonged wetness, these strengths can diminish. This is particularly challenging when buildings are wet to begin with, as terra cotta assemblies can take years to dry out once further infiltration is abated. Reformulated in 2008, clear waterborne Primer 240 develops bond strengths up to 600 psi, and retains that same bond strength even after 100 hours underwater. VOC is <100 g/l, making it usable in all 50 states. You can navigate through product categories and find the individual products of interest, all available package sizes, and unit prices based on order quantities. Products listed in the store include brief descriptions and various options. For example, the Custom System 45 page allows you to specify what substrate you are planning to repair (Limestone? Brownsstone? Marble? Concrete? ), and which of the 6 grades of Restoration Latex you would like to include in your purchase. If you need to check product data sheets for more detailed technical information, a "more info" link brings you back to the information portion of the site. 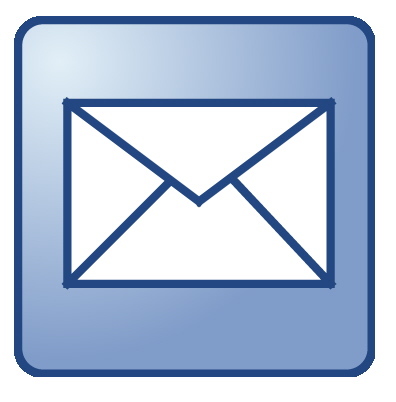 You can place credit card orders, make payments and specify any special needs or instructions. You will immediately receive an order confirmation. ASTM International publication "STP 1494: Natural Cement" represents the most comprehensive publication on the subject in more than a century. The book will includes 10 papers from the First and Second American Natural Cement Conferences as well as supplemental materials from the 19th and 20th Centuries. Papers range from historical treatises on both American and European cements in the 19th Century, to geology, to petrographic methods for historic binder identification, to formulation practices, to contemporary restoration practices to cement chemistry. The volume is edited by Michael Edison, chemical engineer and President of Edison Coatings, Inc. and chairman of ASTM Task Group C1.10.04 on natural cement. For additional information, visit astm.org. The Edison Coatings R&D lab has been hard at work, as always, developing new technology and augmenting existing product offerings. SYSTEM 95 consolidants are a new generation of ethyl silicate treatments designed to deeply penetrate and strengthen stone, masonry, concrete and stucco. Two SYSTEM 95 formulas are offered: The regular grade is 100% ethyl silicate (VOC<600 g/l), designed for maximum strengthening performance; SYSTEM 95-WR-VOC incorporates water repellent technology and is able to meet the stringent VOC <400 g/l limits set by the Staes of New York, New Jersey, Pennsylvania, California and other regional authorities. RL-5 and RL-6 latex modifiers are designed to widen the range of temperatures under which stone, masonry and concrete repairs can be performed. RL-5 doubles working time at temperatures up to 120 F, while RL-6 accelerates set at temperatures below 50 F. There is no additional cost for RL-5 or RL-6 when ordered in conjunction with Custom System 45 masonry repair mortars. The particular grade of Restoration Latex desired should simply be specified at the time of order placement. November 2004: Edison Coatings has begun production of authentic Rosendale Natural Cement® at its plant in Plainville, CT.
Elastowall 351 passed all tests. In the ASTM E96 permeability test, 2 coats of Elastowall exhibited a highly breathable 30.8 perms. This exceeds values published elsewhere for Keim Granital, a modified silicate coating marketed heavily on the basis of high permeability. For additional information visit the Sealants, Waterproofing and Restoration Institute at www.swrionline.com. Edison Coatings has released the fourth in its series of latex modifiers designed specifically for use in Restoration. Designated as RL-4, the new latex provides permeabilities which are ten times higher than those typically measured in sound building stone, to which permeabilities of RL-1, RL-2 and RL-3 are matched. RL-4 provides another option for the Conservator who wants to control permeabilities at levels exceeding those of the substrate. High permeability can be useful in certain special situations, such as retaining walls, the exterior walls of fountains, ruin structures and planters, all of which are likely to experience high moisture exposure from behind the repair (negative side). RL-4 can lso be blended with RL-1 to produce intermediate levels of permeability, allowing customization of permeability to meet each project's specific requirements. Edison Coatings System 45 products have been providing durable, permeable repairs to historic masonry substrates since 1982. Edison remains committed to the ongoing development of its products and technologies, in order to provide the highest levels of performance under the widest array of applications and conditions. RL-4 represents just one further step in that process, assuring that Edison System 45 remains the most customized historic repair mortar system comercially available, and the most appropriate and compatible system for the entire spectrum of historic masonry repair projects. A technical paper by Edison Coatings President Michael P. Edison entitled: Color and Long-Term Color Retention in Composite Repair Systems for Stone and Masonry" has been published in the Fall 2002 issue of the Journal of the Association for Preservation Technology International. The ten-page treatise includes sections on basic color science and results of research into the effects of both laboratory-simulated accelerated weathering and long-term natural weathering. Reprints are available upon request by contacting Edison Coatings, Inc.
Edison Coatings is pleased to announce the release of a new potassium silicate based coating system for masonry and concrete. The product features a natural matte finish, high moisture vapor permeability, extreme long term durability and high bond strength to a wide variety of substrates. It is available in 900 standard colors which can be tinted in-house by Edison Dealers throughout the United States. Custom color-matching is also available. EverKote 300 is formulated from the highest performance European active ingredients, manufactured in the United States by Edison Coatings, Inc.
Edison Coatings has long made use of special washed and screened silica aggregates in its prepackaged mortars and repair coatings. These aggregates are selected for their near zero content of crystalline silica particles in the very small size range which has potential long term negative efects on health. Now Edison has eliminated the use of -270 mesh crystalline silica from all of its formulations. Effective and safe silica replacements have been tested and are now in use. While cost of the non-silica replacement is a little higher, we believe that it's worth making the handling and use of these products safer for both our workers and for our customers. Edison Coatings closed its Waterbury, Connecticut plant in March 2000 and relocated to a newer, much larger facility in Plainville, CT. For information on our new location, click here. A January 2000 report issued from the Columbia University Carleton Laboratory confirms that Edison Custom SYSTEM 45 Sandstone patch absorbs and transmits liquid water more compatibly than the competitive sandstone patch. Testing was undertaken by the laboratory at Edison's request, following the appearance of competitive advertising claims indicating that latex-modified mortars (by inference, Custom 45) do not transmit liquid water, and suggesting that this makes them incompatible with natural stone. But in truth, the study data showed that Edison Custom 45 transmitted water at a very compatible rate, slightly higher than natural sandstone, while the competitive Jahn M70 was excessive, several thousand times more permeable. Jahn patch exhibited through-leakage within those initial 5 minutes as well. "The Jahn M70 absorbed more water in 5 minutes than the sandstone or the Custom 45 did in 10 days", the report observes. "Using a repair material that allows rapid penetration of moisture through the repaired surface into the stone and through the masonry wall can cause serious damage" the report states. "There is no industry standard that directly addresses or specifies desirable or undesirable levels of water permeability for repair materials", the report states. "The objective, however, should be to achieve a kind of balance, allowing internal moisture to pass through the patch material, while maintaining reasonable water-shedding characteristics for repaired building surfaces. Generally we would like the permeability of the repair material to be relatively close to that of the sound building stone substrate. This particular performance property should also be weighed against other goals, such as high tensile bond strength and low shrinkage." Earlier testing indicated that Custom 45 bond strength far exceeds the bond strength of the Jahn mortars. (See News item, below). The following test data were developed using low-pressure tube testing methods developed by the International organization RILEM. Edison Coatings released a new generation of latex modifiers for cement-based mortars in 1999. Unlike traditional acrylic latex modifiers, Restoration Latexes RL-1, RL-2 and RL-3 incorporate reactive monomers which improve bond strength, workability, through-cure and water resistance. In hot and dry weather, RL-1 modified mortars do not "skin" or "crust" over, like traditional latex mortars. They remain workable for nearly twice as long before through-setting, regardless of patch thickness. Restoration masons working on projects in hot climates such as Central and South Texas have reported dramatic workability improvements, enabling repair work to proceed even as temperatures topped 100 degrees F (38 C). RL-2, a casting grade modifier for fine castings, may be used in conjunction with Custom SYSTEM 45 repair mortars, as well as a number of other cement-based toppings and patching compounds. It is superplasticized to provide high slump at moderate water:cement and polymer:cement levels. RL-3 is a highly reactive latex modifier for use in severe industrial and marine applications. 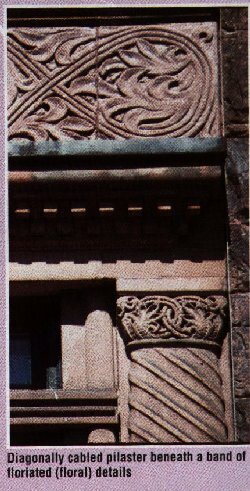 In an article entitled "Synthetic Patching Saves Historic Brownstone", authors David Biggs and Elizabeth Keating describe the restoration of a unique 1889 brownstone in Albany, New York. While many brownstone repairs have been performed over the past 17 years using Custom 45 brownstone patch, the project is exceptional in the extent of ornate detail that had to be recreated due to extreme deterioration of the original stone. 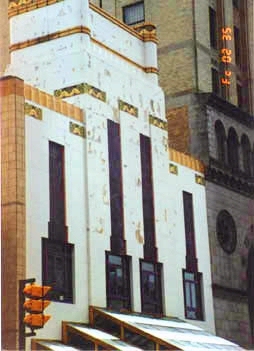 Approximately 60% of the entire facade was rebuilt using Custom 45 patch, including numerous floriated details. Work was performed by union mason Zbigniew Swieton of Ganem Contracting Corp., based in Clifton Park, NY. Swieton sculpted the Custom 45 to replicate the original details working from a set of photographs. ``When the repair was completed in 1996", the article states, ``not a single feature of scrollwork had been lost from the original facade. Synthetic patching had enabled a 20th century mason to duplicate the intricate carvings of 19th century masons so that passersby could enjoy them well into the 21st century." The January 1998 issue of the International Concrete Repair Institute's Concrete Repair Bulletin includes an article by Edison Coatings President Michael Edison on the subject of aesthetic repair materials. The Cover Feature article includes discussion of the performance properties required in aesthetic repair materials, and the special considerations involved in Historic Masonry and Concrete restoration work. A draft of the article's text can be found by clicking this link: Aesthetic Repair Article. Edison Coatings has been selected for a Special Projects Award from the International Concrete Repair Institute. 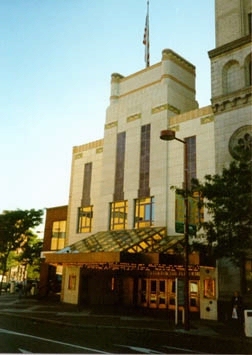 The subject project, the Center for the F. M. Kirby Center for the Performing Arts in Wilkes-Barre, Pennsylvania, involved a terra cotta restoration performed by Masonry Preservation Services of Berwick, PA, who submitted the nomination and shared the award. Custom SYSTEM 45 terra cotta patch was used. Edison had previously won an ICRI award for its participation in the repairs to statuary and stone work at the Breakers and Rosecliff Mansions in Newport, Rhode Island. A series of reports from Columbia University's Carleton Laboratory professional laboratory staff confirm Custom SYSTEM 45 Terra Cotta Patch Breathability (Moisture Vapor Permeability) and moderate liquid water permeability. The studies, performed from late 1997 to mid 1999, directly compare vapor transmission data for terra cotta, Edison Custom SYSTEM 45 terra cotta patch and Jahn M100 terra cotta patch, and liquid water permeability data for Edison Custom 45 sandstone patch, Jahn M70 sandstone patch and Pennsylvania red sandstone. The conclusions state that the vapor permeability of both the Edison and Jahn patches are "more than one order [of magnitude] higher than that of terra cotta." Testing was performed in accordance with ASTM E96-95, "Standard Test Methods for Water Vapor Transmission of Materials". The water permeability testing indicated that while Edison patch and sandstone exhibited similar rates of water absorption, the Jahn M70 was several thousand times more permeable than either of the other materials. The Jahn patches leaked-through in less than 5 minutes exposure to a 5 ml head of water in a RILEM low pressure tube, simulating wind-driven rain. Edison patches and sandstone did not leak through after ten days exposure. The researchers expressed concern that Jahn patches do not restore the natural water shedding characteristics of the stone surfaces to which they are applied, potentially allowing excessive moisture infiltration and consequential deterioration. In an unrelated Columbia University study, Direct Tensile Bond Strength of Custom SYSTEM 45 and Jahn M70 limestone patch were compared. Edison patches achieved a mean tensile bond strength of over 200 psi, as opposed to only 60 psi for Jahn M70. ICRI Guideline #03733 recommends that repair materials develop a minimum of 100 psi direct tensile bond strength, and notes that many specifiers routinely require 125 psi or even higher. Products which fail to achieve this minimum bond strength are likely to experience serious problems, according to the guideline.